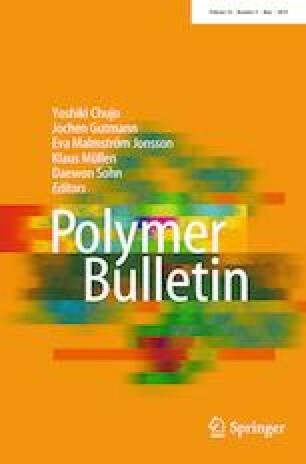 This paper investigates the effects of increase of reaction mixture viscosity on the kinetics of linear polymer creation in a bulk heteropolyaddition process of 2,4-toluene diisocyanate (TDI) and 1,4-butanediol (BD). The paper presents a method for solving a system of bulk polyaddition of 2,4-toluene diisocyanate and 1,4-butanediol process balance equations, allowing the determination of the process kinetic parameters. Determination of polymerisation reaction kinetic parameters was also made possible by the use of the so-called partial reaction rate constant. Such an approach enabled a significant simplification of the mathematical expressions describing the heteropolyaddition process and provided an opportunity to associate kinetic parameters with the average molar mass of the mixture and, thus, with the viscosity. The method presented herein facilitates an analysis of the linear polymers heteropolyaddition process. Very often during the course of polymerisation processes, the viscosity of the reaction medium changes. When these changes significantly influence the polymerisation process rate, it becomes necessary to take into account these variables in balance equations describing this process. The need to take into account changes in viscosity means that systems of mass balance equations describing the polymerisation process are usually quite complex and often difficult to solve due to the large number of unknown kinetic parameters. In connection with difficulties in determining polymerisation process kinetic parameters, literature often assumes the same value for all constant rates of these reactions (k = const), and the effect of viscosity changes on the numerical values of the k constants is ignored. Used method is appropriate for systems, where viscosity is practically constant. 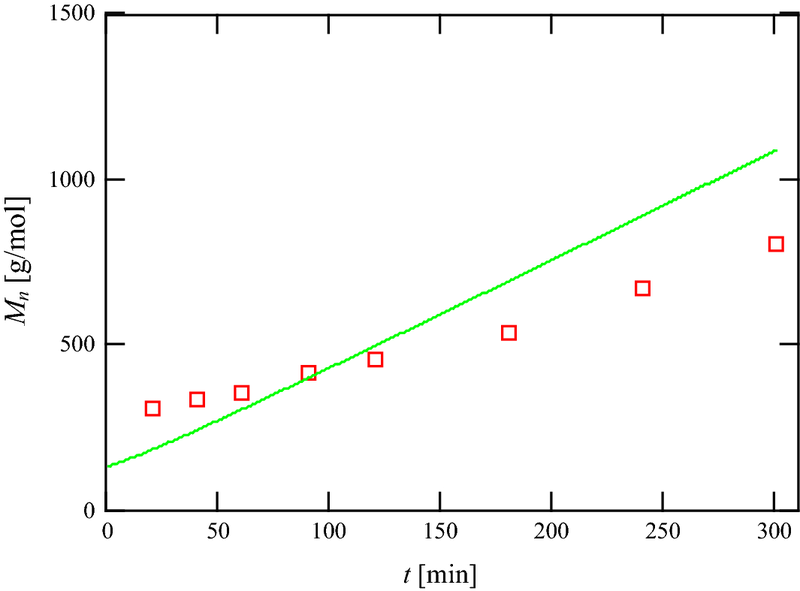 This paper attempts to take into account increasing viscosity of the reaction medium on the kinetics of the linear polymer creation process occurring during heteropolyaddition process. 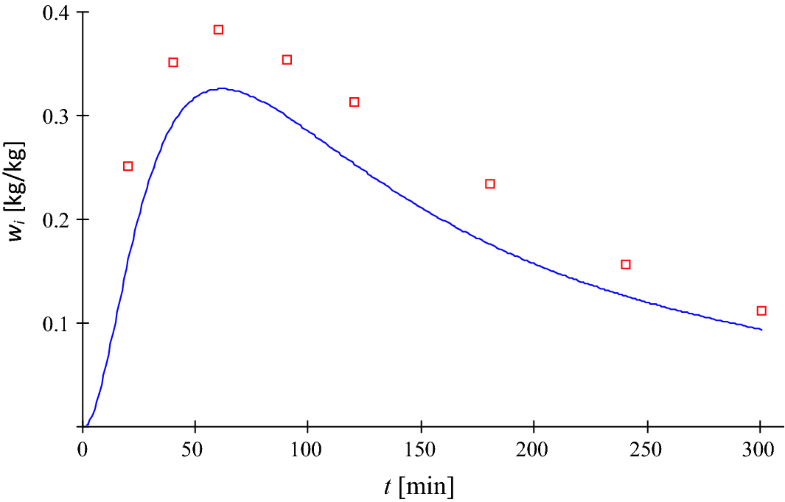 The increase in average molar mass of the mixture and, thus, the viscosity caused by the course of this process makes the constant reaction rate numerical values decrease and as such may have a significant effect on the results. Due to the complexity of the mass balance equation system and the necessity to take into account viscosity changes in numerical calculations, this paper uses the concept of partial reaction rate constants, the introduction of which into the balance equations allows a meaningful simplification of the mathematical model describing the polyaddition process being considered here . 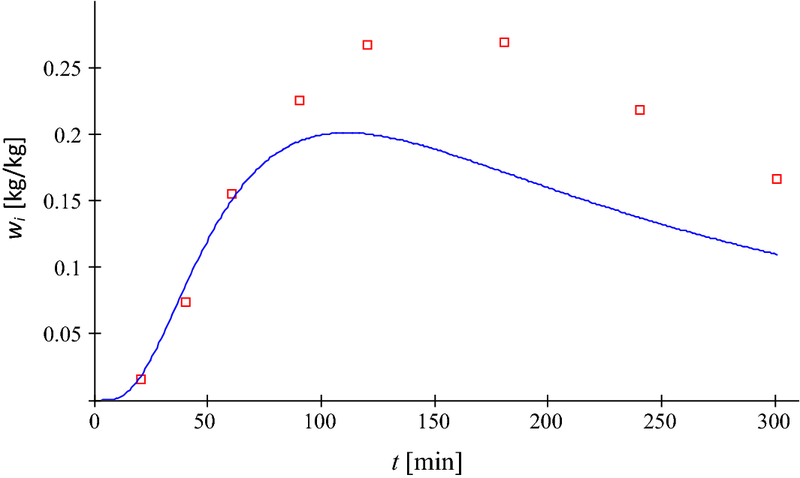 The influence of viscosity on the polymerisation rate has been taken into account by associating that rate with the number-average molecular mass Mn of the reaction mixture, which provided an opportunity to associate kinetic parameters k with the number-average molar mass Mn. Using the derived mass balance system of equations, which takes into account number-average molar mass changes on the reaction rate constant numerical values, kinetic parameter values for the analysed processes were determined. The presented method facilitates determination of partial reaction rate constant numerical values and, thus, it assists the progress of polymerisation kinetic parameters definition, which facilitates the system of balance equations to be solved. 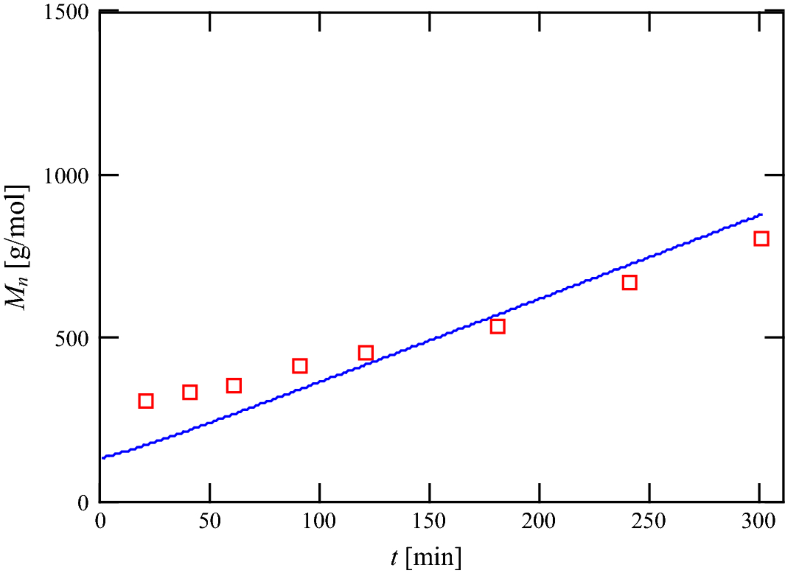 Literature data  show that in real systems, very often during the course of polymerisation processes, the viscosity of the reaction medium changes. 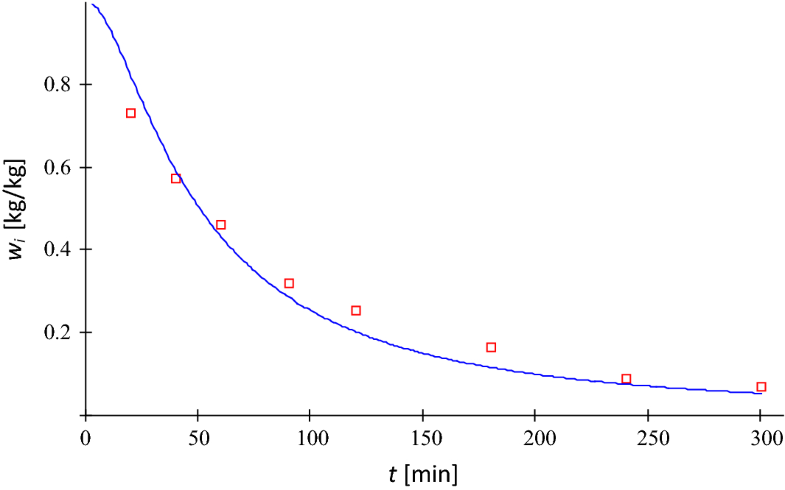 When the viscosity changes significantly influence the polymerisation process rate, it becomes necessary to take into account these variations in rate equations describing this process. A change in the viscosity of a reaction system, most often exhibiting itself by a change in the numeric kinetic value (which determine rate of reaction), causes a reduction in the reaction rate numerical constants, which should be taken into consideration in numeric calculations. Changes in viscosity, during the course of a polymerisation process, cause a change in the process kinetic parameters, resulting in adding significant complexity to the mass balance equation system. As reaction rate constant values change with the progress of the polymerisation process, it becomes necessary, from the point of view of numeric calculations, to determine the reaction rate values at each step of the said calculations. In order to make it easier to associate reactants with the used model (2), toluene-2,4-diisocyanate was marked with symbol A and 1,4-butanediol with symbol B. Heteropolyaddition process modelling was performed on the basis of model (2) and laboratory tests carried out in the paper . The authors of this paper focused entirely on the completed research presented in the paper . The heteropolyaddition process was carried out in a batch reactor with ideal mixing at a constant temperature of 86 °C in a solution of chlorobenzene (C6H5Cl) and tetrahydrofuran (THF) at a mass ratio of 1:1. The prepared reaction mixture consisted of 30 g of toluene-2,4-diisocyanate (0.172 mol) and 15.5 g of 1,4-butanediol (0.172 mol) dissolved in 409.5 g of chlorobenzene and tetrahydrofuran solution. Due to the 10% concentration of the reactants, the analysed example of the reaction solution should be considered as diluted solution. The heteropolyaddition process was analysed for 300 min during which the authors of  took samples at different intervals in order to determine the concentration of free functional groups –NCO using the GPC method. The results of the experimental studies are summarised in Table 1. F1—fraction 1 is equal to the sum of the concentration of components A and B.
F2—fraction 2 is equal to the concentration of component AB. F3—fraction 3 is equal to the sum of the concentration of components A1B2 and A2B1. F4—fraction 4 is equal to the concentration of component A2B2. F5—fraction 5 is equal to the sum of the concentration of components A2B3 and A3B2. F6—fraction 6 is equal to the concentration of component A3B3. The numerical calculations of the presented heteropolyaddition process were based on model (2), on the basis of which a calculation algorithm was built in the Mathcad Prime 2.0 software that allows for approximation of kinetic parameters of the process and consequently for determining the kinetics of the polyurethane-forming reaction. The calculations were based on the results of experimental studies in Table 1 and the model of the heteropolyaddition process (2). All calculations were done starting with determining the reaction rate constant kAB = 5 × 10−4 dm3/(mol s) with the assumption ki = const. Equation (4) defines the correction coefficient, which is a dimensionless number, with two parameters γ1 and p characteristic for a particular polymerisation process. 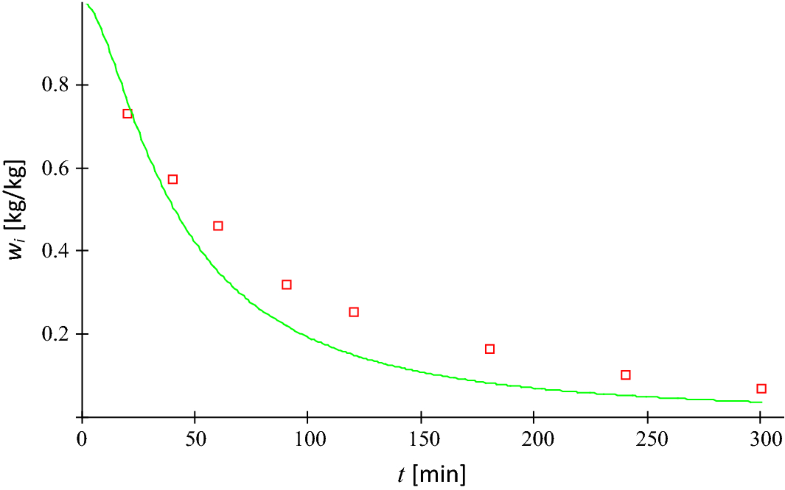 Due to this fact, the partial reaction rate constant of ki decreases with the increase in the number-average molar mass of the forming polymer. As a result of the calculations done, parameters p = 0.01 and γ1 = 1 were obtained from Eq. (4), which then allowed to estimate values of the partial reaction rate constants, as summarised in Table 2. Determination of kinetic parameters for two different ki values, ki = const  and ki = k1Zi, allowed to determine how the mass ratios of respective polymer fractions change with time, and compare them with the results of experimental research, as shown in the figures below. The results of model (2) research are summarised in Table 3 and compared with the experimental data. with a reaction rate constant dependent on the average molecular mass of the polymer ki = k1Zi. On the basis of Figs. 1, 2, 3, 4, 5, 6, 7 and 8 and data in Table 3, it can be concluded that if the increase in viscosity of the reaction mixture is omitted and the same reaction rate is assumed during the whole process of heteropolyaddition of 2,4-TDI with 1,4-BD, the result obtained from the sum of objective function (5) for all analysed fractions Smin = 0.1388 is twice higher than when including the changes in the average molecular mass of the forming polymer (and thus viscosity) Smin = 0.0623. In the above equation, the following symbols were used: Sc—results of calculations without changes in viscosity; Sη—results of calculations with changes in viscosity; and β(η)—numerical value of correlation coefficient included in the range (0,1): β(η) ∈ (0,1). The measure of the influence of viscosity on the polymerisation process in this case is the value of the correlation coefficient β(η) which increases with the increase in viscosity influence on the process. The value of this coefficient was βt(η) = 0.551. The figure below shows the dynamics of changes in the correction coefficient Zi in relation to the average molar mass. It is worth noting that this case is an example of a polymerisation in diluted solutions, as evidenced by a small change in the Zi correction coefficient, varying between 0.9530 and 0.9550. 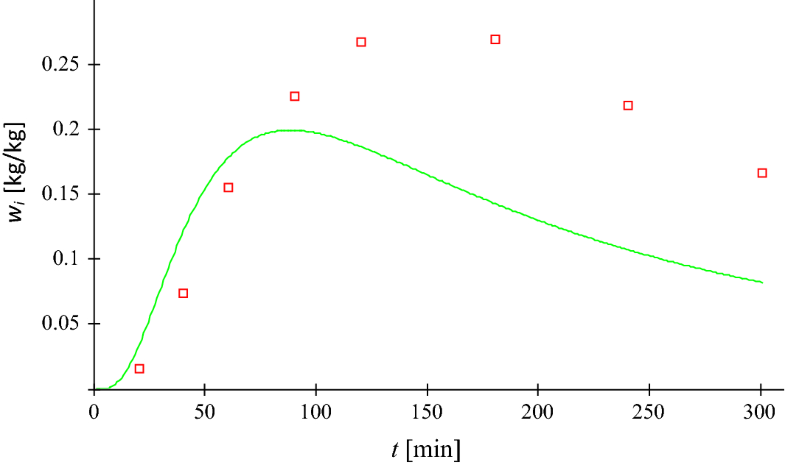 Comparing the results of polyurethane formation process modelling with the results obtained in the studies [1, 4], it should be emphasised that the proposed method of determining kinetic parameters is rather reserved for cases where the viscosity of the reaction solution has a significant influence on the speed of the polymerisation process. 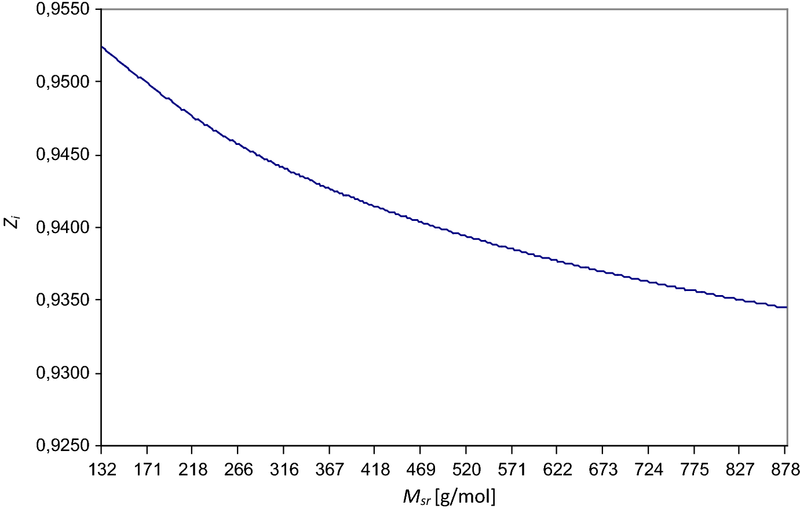 The viscosity influence on the rate of heteropolyaddition process is determined by the correction coefficient Zi related to the average molar mass of the forming polymer. It should be noted that the Zi correction coefficient in the analysed process of heteropolyaddition of chloride 1,4-benzene dicarbonate with diglycidyl ether of bisphenol A is in the range of 1.6–0.2 , while that in the heteropolyaddition of 2,4-TDI with 1,4-BD is in the range of 0.9530–0.9550 (Fig. 9), which indicates that there is a significant influence of viscosity on the process in the first case. Despite the high dilution of the reaction mixture and slight change in viscosity of the system during the process, it can be observed that the proposed method gives better results in clarifying the process. This paper deliberately analyses a process in a solution in which the viscosity is not likely to affect the speed of the polymerisation process or its influence is negligible. The aim was to examine how model (2) behaves, assuming a variable value of kinetic parameters. 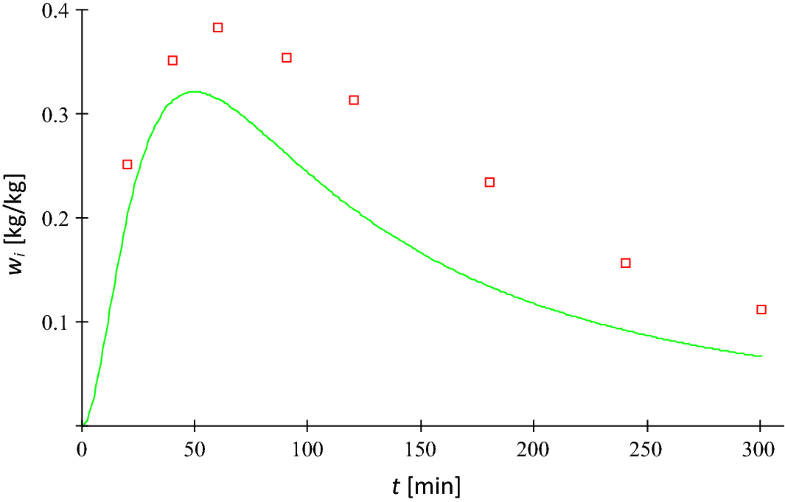 As we can see, despite slight changes in viscosity of the system resulting from a small increase in average molar mass of polyurethane, the proposed method of kinetic parameters calculation gives a better approximation of the course of polyaddition process of 2,4-TDI with 1,4-BD than the model based on the same kinetic parameters for the whole polymerisation process. The results obtained show that the applied approach proposed in model (2) is universal, and prove that kinetic parameters change during the heteropolyaddition process.